Actor Joseph Gatt brings inhuman intensity to his workouts. It's just part of the job description when you portray the gods! It's hard not to get typecast while trying to forge a career as an actor, but if it's going to happen, there are worse things to be typecast as than demigods. After semi-pro soccer didn't pan out as a career for Joseph Gatt, his athletic physique helped him make representing the supernatural his professional domain. One of Gatt's earliest roles was as the titan Atlas in a made-for-TV version of Jason and the Argonauts—talk about an ego builder. In recent years, you may have also controlled his every leap, hack, and slash in the popular video game series God of War, for which he provided the motion capture acting of the central character, Kratos. Not long ago, he played a Norse frost giant battling Chris Hemsworth's title character in the movie Thor, and an enhanced cyber-human on the deck of the USS Enterprise in the twelfth Star Trek movie, Star Trek Into Darkness. All the while, he has lent his distinctive countenance to a steady stream of fashion ads for the likes of Giorgio Armani, Gucci, Guess Jeans, and Levi Strauss. 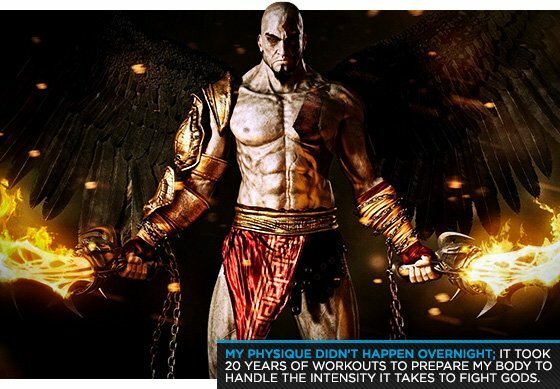 The day after the release of his latest blockbuster, Gatt, a former Royal Marine, talked with Bodybuilding.com from his home in Los Angeles about his superhuman workouts, the challenges of making weight, and the unique way in which "God of War" makes its way into his exercise regimen. You've been a Royal Marine, a semi-pro footballer, a fashion model, a motion capture actor, and an actor playing both humans and superhumans. Which of those is the most physically demanding? The Marines was horrifyingly demanding. But in a weird, torturous, sadomasochistic way, I loved it. There's nothing more rewarding than completing that assault course, nothing. Even completing a tough leg workout isn't as rewarding. And we all know about those leg workouts. You hate them, you don't want to do them, but you have to, but when they're done, the relief is so incredible. Now multiply that by 100. That's what it's like completing the marine assault course. Today, I try to make every single workout as challenging as an assault course. I never coast through a workout. This is been great for me physically, but it's also become a problem in two ways. One is that no matter how I'm feeling on a given day, I will absolutely kill myself in the gym, and it takes a huge amount of energy do that. I commit 110 percent. The other problem is that finding a workout partner is impossible. Nobody wants to work out that way, even people who think they do. I've had so many friends say to me, "Joe, I want to work out with you." I say, OK, cool. So we'll go do a workout, I'll hear nothing but moaning and complaining from them, and then all of a sudden when I want to arrange the next workout, they're never available. I learned to work out by myself. I had a great workout partner back in London, but unfortunately since moving to the states it's been difficult to find one. Do you think that has anything to do with those 990-pound leg presses I saw you doing online? Yeah, maybe. The thing about those is that a few years ago in Gold's Gym in Venice, I was pressing 900 pounds or something—you know, just for fun—and people started watching it. And then when I booked Banshee, I started to hear something about the "The Albino workout" and "The Kratos Workout," because I played Kratos in God of War. I thought that was kind of funny—the Kratos workout. So I figured I'd put some things up, because people ask me about my workouts. A lot of people don't do dips with 100-pound dumbbells stuck between their knees or leg press 900 pounds. I wanted to show people that my physique didn't happen overnight; it took 20 years of workouts to get to the point where I can handle that type of intensity. But they're for my benefit as well. I have days when I go to the gym and I can't push that 315, but then I look at my video of me benching 6 reps at 315, and I know I did do that. That wasn't a dream. That wasn't some weird fantasy. So I know that next time I'll go in and I'll do that. Because you're such an intensely physical actor and have played gods and superhumans, do directors feel more comfortable asking you to show up in a certain shape? For example, "I need a guy with arms this big or with a chest like this." The only role that I've really had to do that for so far was for [Showtime crime drama] Banshee. The character description was for this gigantic, huge albino character. Now, I'm not a small guy. I'm 6-foot-2, 215 pounds. I think at the time when I booked the role, I think I weighed about 210 pounds. And then I looked at the character in the show I had to do my major fights with, and he was about 6-foot-0, but much slimmer. But I was still concerned that I wasn't fulfilling what the producers wanted. I got paranoid, and I started to think, "I need to get bigger. I need to somehow get much bigger." I had about two months before I had to go out to Carolina to start working on the show. I really started making sure I was getting my calories. That's my main weakness when I work out: not getting enough calories for my bodyweight and the way that I train. So I started really trying to focus on getting some kind of meal replacement or whey protein drink at least every two hours during the day, and trying to eat at least one or two proper real food meals in the day. I also started training even heavier while keeping my workouts shorter, so I wouldn't overtrain. And it seemed to work. I got myself up to 220 and on screen I look like a monster, which is hilarious. I never saw myself looking that big, ever. But that's the only time I've had to change my physique in a major way for a show. A lot of people have asked me if I would be willing do that for a role. I don't know if I would, because I see Christian Bale and other actors who lose 100 pounds for a role and then pack it back on again. You and I both know it's a very unsafe way of living your life to do that kind of thing. I love acting. It's my profession, but my body is my life. And I don't want to abuse my body to the point where in 10 years time my heart is going to say, "I've had enough! You can't keep treating me like this, so I'm just going to have a heart attack on you." How important are supplements in your process of staying ready for a variety of roles? I think it's impossible to maintain a good, strong, muscular physique without taking some supplements. Between the protein shakes and the multivitamins that I take, I use C4, the pre-workout mix. I try to keep it as basic as I can, but I think I would shrink and disappear if I stopped taking protein shakes. When you get to a certain size, you need to be taking in a certain amount of calories just to maintain yourself, let alone grow, repair, and rebuild. And it would be impossible, especially for someone who is busy and working a regular job, to eat that many meals, to spend the time preparing those meals, and eat those meals on a daily basis. I remember when I was working on Star Trek Into Darkness, Zach [Quinto] and Chris [Pine] had personal trainers who prepared their meals for them, so they had little Tupperware containers ready like every two hours. You know—a breast of chicken and a little bit of rice. And I'm thinking, Wow, it's really lovely to have someone to do that for you. Whereas, there I am sucking down my 100 percent whey protein I ordered from Bodybuilding.com. But that's just the way a real person has to be. It's impossible to take in that many calories, or at least, that many healthy calories. You can do it if you're going to eat doughnuts and pancakes all day, but obviously that's not going to do me much good. 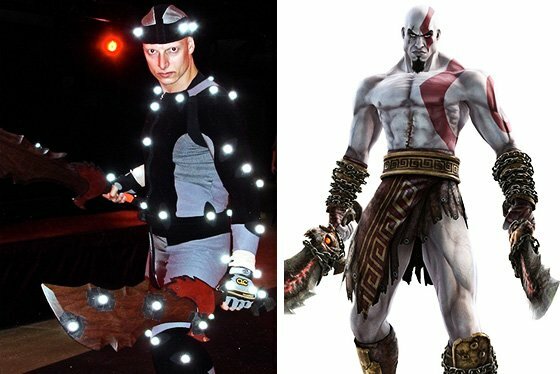 You've done the motion capture for the last three God of War installments, in addition to a number of other video games. How has your training or preparation changed over that time? God of War was a huge amount of fun. It was very, very physical. Luckily, a lot of my martial arts experience came into that. And I'm fortunate that when I went to drama school, we had a lot of dance training as well. So I had pretty good coordination. And that combined with my martial arts experience and my basic physicality, I was able to really have fun with that role, doing the really large movements. It's very physically demanding work. I'll probably spend half an hour to 40 minutes warming up, before, you know, once I get into the motion capture suit, I'll spend the next 40 minutes warming up and stretching out fully before I actually start to work. Have you ever played the game for motivation before a workout, similar to how you watch your videos? You know, I've only ever played God of War while we were shooting it. I've seen a lot of the videos, but while we were shooting God of War, they had a green room for the actors to hang out in, and they always had the newest game on the big screen. So we'd sit there playing God of War to get us into the mood. It was definitely strange watching myself and then going out and doing the same thing. But ironically, when I'm going out for a big workout, I listen to the God of War soundtrack. It's usually that, the soundtrack from Star Trek, or the soundtrack from Gladiator. They're all very epic sounding, very dramatic. I kind of picture myself as the character. 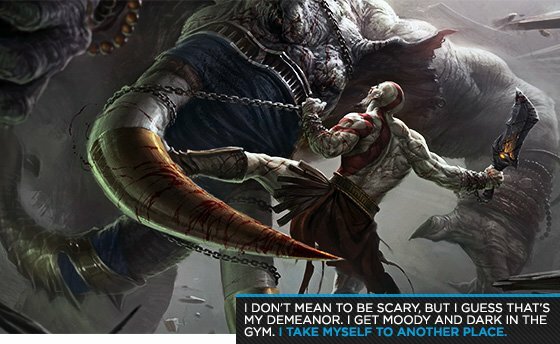 Once you start imagining that you're Kratos, do you find people moving away from you in the gym? They do that anyway. Apparently I'm a really scary person in the gym, so I've been told. There's one guy who's a really good friend of mine in the gym—or he's a really good friend now. I remember when he first came up to me at the gym, I smiled and said, "Oh hey, hi." And he said, "Oh my god. You smiled!" And I said, "Yeah, that's what I do sometimes." And he said, "I've been wanting to come up and talk to you, and tell you that you work out really hard and you've got a really great physique, but I'm really scared of you." I don't mean to be scary, but I guess that's my demeanor. I get really moody and dark in the gym. I just focus on what I'm doing. I wear my headphones, and I try to take myself to another place, so that I can just focus on what I need to do. This comes very hard, because I'm a very social, friendly person. If someone's speaking to me, I want to talk to them. I'm not going to say, "Get the hell out of my face. How dare you speak to me!" How does being able to access that type of intensity in the gym help you in the rest of your life? The gym is really like a church to me. I know a lot of Bodybuilding.com readers are going to understand that. Some people can think about other things while they're working out. With me, it's the complete opposite. When I'm working out, I focus 100 percent on the workout. If there's anything that's in my mind that's causing me stress or angering me or confusing me, it's wiped clean. It's incredible. It's almost like a meditation. And then when I leave the gym—especially if I've had a really good workout—I feel light on my feet, happy, and removed from all of the negativity that I had before. It kind of sets me on the right course again. I absolutely love it. This is why it's great to work out early in the day. I'm not very good at that, because I'm not great in the morning, but whenever I can, I work out in the morning. Without a shadow of a doubt, it helps me in my everyday life. When do you think you were in the best shape of your life? That's a really good question. I would have to say probably now. I feel like my physique and my health is improving every day as I get older, and I'm learning more about my body and I'm learning more about the right way to exercise. Because we all know there are absolute rights and wrongs in regard to health and fitness, training and nutrition. But there is also a huge gray area in between, and through experience you find the right way that works for your body. With all your years of experience, do you still spend lots of time researching before you tweak what you're doing in the gym? Oh yeah. I spend so much time on Google it's ridiculous. And my girlfriend, she's really into fitness as well. And so we're always discussing. Whenever a new trend comes out or a new type of workout, we sit down and we look at it. We figure out if it's something worth doing, or if it's just a rehash of something that's been around for 20 years—which most of them are. Ultimately, a lot of them are about the quick fix: how to suddenly get fit, lose 50 pounds, become muscular overnight. And none of these things work. In fact, most of them are really unhealthy and dangerous. My main priority is longevity. I want to be healthy, fit, and muscular in a real-world way. I don't want to be damaging my joints or tearing my muscles on a daily basis like people do when they use bad form and don't really know what they're doing. I'm not training for a particular sport or to peak at a particular time, so that afterward I can eat a lot of cake and be done with it. I want to be able to do 100 push-ups when I'm 90 years old.